If you are a fan of pasta, you know that there are many different types of pasta noodles. You may also know that certain noodles are best when used in certain dishes. People who don’t cook often may not care or notice a difference in their pasta dishes when they use different noodles, but there is a difference. Spaghetti noodles seem off with anything other than tomato sauce. According to Italy Magazine, there are approximately 350 different types of noodles. That is a lot more than you may have imagined. And most of these noodles are perfect paired with specific types of dishes. Adding the wrong noodle to your dish may ruin a perfect good meal. Knowing the difference between these noodles may not be important information but it gives you some fun facts to share over a bowl of pasta! At Chef Marc’s Trattoria, you can enjoy a wide variety of pastas with the perfect noodle selection. From lasagna to a more unique black pasta, you can find it all at our high end Italian restaurant. Let’s take a look at some of the different noodle types and what type of dishes they are best in! These dainty noodles are the slimmer version of spaghetti noodles, but not as popular. These are great for dishes with a light sauce and seafood. If you are looking to make a pasta that is delicious with something as simple as butter or oil and seasonings, this is the perfect pasta type. This pasta has a unique shape. 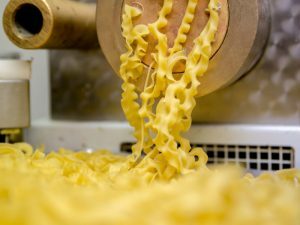 For the best description, just take a look at the meaning of the name campanelle, which means “bellflowers.” The rolled noodles have waved edges and create the perfect shape for thicker and meatier sauces. The bell-shaped noodles are great for holding sauces and ensuring you get a tasty and flavorful bite each time. These noodles are generally filled with cheese, meat, or vegetables, for added flavor and a unique noodle. They are ring-shaped and are great to enjoy with a light sauce, whether it is a tomato-based sauce or some type of garlic sauce. This wagon wheel shaped pasta is a fun noodle type. While you may think these are perfect for your kids, they are great noodles for meat sauces or sauces with veggies. These are great noodles for soups and are often added to noodle casseroles. This is a classic noodle that everybody knows and love. The square noodles are often stuffed with cheese, veggies, meat, or seafood for a new and exciting twist on pasta. This type of noodle is great in just about anything, it just depends on what they are stuffed with. They are great in soups, drizzled with olive oil, or paired with a delicious sauce! These are a very small sample of the hundreds of noodles that exist! 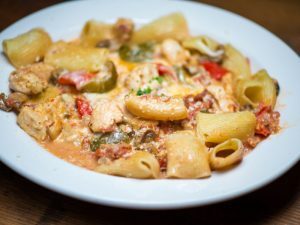 If this look at noodles made you hungry for some authentic tuscan pasta dishes, stop by Chef Marc’s. We offer a variety of delicious dishes that can help you satisfy your hunger.